Pixels 2014 takes place on Saturday 8th November at Talbot Green Community Centre. Gwynfa is delighted to announce that the judge for the event will be Tony Potter from the West Cumbria Photo Group. He is the organiser of the UK Small Print Circuit. It is the 10th running of an event which evolved out of the Gwynfa Contemporary Competition. Studio Lighting Equipment with backdrops. And a Mini Studio Setup – for table top photography. The above was previously available for £5 per stint. Up to 2 weeks (14 days) free. 3 weeks (15 – 21 days) £15 – you’ll pay the full 3 weeks fee. This charge is to encourage return within the agreed period. 4 weeks (22 – 28 days) £20. 5 weeks etc, just keep adding a £5 per week. Etc, just keep adding a £5 per week. It should be remembered that even at £5 per week, this is a very cheap option for loaning this type of equipment. Note that hire durations may be restricted based on other members’ prior booking requests. The club’s calibration equipment – for colour managing and setting up your monitors, projectors and printers, for £5 per borrow. This is available through Alan Shepherd who can also guide you through the calibration process if necessary. The Club’s Calibration Equipment is the top of the line, but it is getting old and is incompatible with some of the latest operating systems, especially for the Mac. It does however, still work with the club’s laptop and projector. The committee is now considering buying new equipment capable of calibrating monitors, projectors and printers (creating profiles) that will be compatible with the latest computers, including Macs. This new equipment will cost approx. £320. As a club we always encourage members to continuously improve their images and digital workflow. Calibration is an essential step towards this goal. However, before we spend this amount of club funds we need to justify potential usage and establish how many people would consider utilising this sort of equipment, (help would be available if needed, so don’t get put off by the technical nature of this equipment). Please let Steve Littlewood know by E Mail or word of mouth in club, if this is something you wish the club to have, or you’d personally utilise. As with the current equipment, there would be a fee of £5 levied for a week’s loan. Bargain! Based on previous calibrator usage, the equipment should pay for itself within 3-4 years. 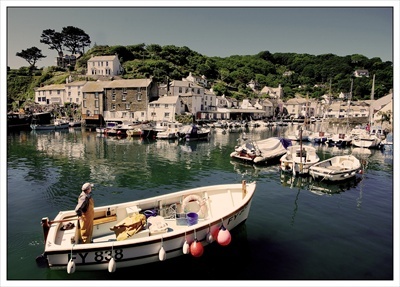 Dave Owen has had one of his photographs published on the Polperro tourism website. You can visit the website here. Well done Dave!